The Medici were also legendary for their adeptness at intrigue and murder. In 1537, for example, Cosimo I came to power when the reigning duke, Alessandro Medici, was assassinated by a cousin. The 18-year-old Cosimo--son of Giovanni Medici, the family's greatest military captain, but from a junior branch--was not accepted by many of the leading families of Florence. They took up arms against him, but Cosimo was victorious on the battlefield. And those of his opponents who survived, including Alessandro's murderer, met with "unfortunate accidents" shortly thereafter. Many of the leading Medici were buried in the Chapel of San Lorenzo in Florence, which long enjoyed the family's patronage. In 2004, we obtained Superintendent Antonio Paolucci's permission to examine 47 of the Medici interred there, including Cosimo. The multiyear project is a unique opportunity to study the health of the Medici (a rare look at a single family over a long period) and might settle allegations of murder to be found in legends about the dynasty. We had no idea what we would find. In 1857, after it was discovered that the Medici tombs, then above ground in the chapel, had been plundered, their remains were buried below its floor for protection. Brass plaques set into the floor indicate where they were buried, but there were no precise records of how they were buried. 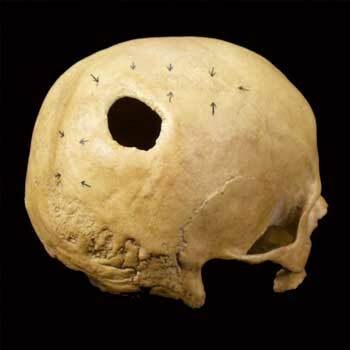 Moreover, in 1947 researchers intent primarily on examining the skulls exhumed several Medici but left virtually no record of what they found or how they reburied them. A final uncertainty was what effect the disastrous 1966 flood of the Arno River, which inundated the chapel, might have had on the remains. Gino Fornaciari is professor of the history of medicine and pathology at the University of Pisa. Bob Brier is senior research fellow at the C.W. Post Campus of Long Island University and a contributing editor of ARCHAEOLOGY. 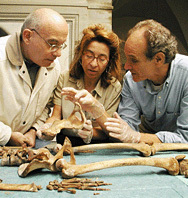 Antonio Fornaciari is an archaeologist with the Medici project. Are there skeletons in the closet of renaissance Florence's first family? For three centuries the Medici family dominated Florence. Great patrons of the arts and sciences, they are associated with the likes of Michelangelo and Galileo. But in Crypt of the Medici, we are told of "tales of strangled wives, poisoned husbands, and murdered sons." Were the Medici normal folks or were they the "most sinister family in history"? Can we answer the question by looking at their bones? That's the basis of this show. Before viewing Crypt of the Medici, I took in the Medici on Wall Street exhibition at Federal Hall to get better acquainted with the family. Part of the Splendor of Florence program of exhibitions, lectures, and concerts in Lower Manhattan, Medici on Wall Street consists of 17 portraits from the Uffizi Gallery in Florence. The Medici, who built their dynasty on their banking fortune, would appreciate the location. Federal Hall faces the New York Stock Exchange and is around the corner from the Federal Reserve Bank, which is built in the style of a Florentine palace. All but one of the portraits are of Medici family members. Most were done as official works and show the subject associated with emblems of power (a crown placed on a desk in the painting), and costumes reflecting wealth (some adorned with masses of pearls) or position (a cardinal's robes). One of the most magnificent portraits in the show is of Cosimo I (1519-1574), shown as a young man in splendid armor, who came to power after the assassination of Duke Alessandro in 1536. Cosimo married Eleonora of Toledo, the daughter of Spanish Viceroy in Naples, and these two and some of their numerous offspring are the central figures in Crypt of the Medici. 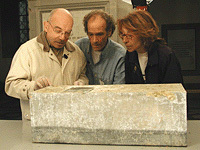 Doing the investigation is paleopathologist Gino Fornaciari, along with a team from the University of Pisa, and mummy specialist Bob Brier, who takes part in the recovery and examination of the remains and serves as host for the show (Brier is also a Contributing Editor to ARCHAEOLOGY magazine). The crew begins cutting into the floor of the Church of San Lorenzo, beneath which the Medici's remains are interred in crypts. Whether anything remains worth studying is a question, because the crypts were inundated when the Arno River flooded in 1966, and because an earlier opening of the crypt in the 1940s was not documented. Tension mounts, but ultimately the remains of Cosimo, Eleonora, and their sons Giovanni and Garzia are found to be in good condition. It's this group that is at the center of a "four hundred-year-old murder mystery." The story is that Garzia stabbed his older brother while on a hunting trip, and that the enraged Cosimo then killed him. So, do the bones show any traces of violence? Is there any other explanation for their deaths in 1562? Sorry, you'll have to watch the show to find out. The work on the bones is covered fairly well, with bits and pieces of instruction thrown in, so you'll learn about determining age from bones and teeth, see how illness can effect bone growth, and see evidence of a pretty nasty dental infection. The description of how alterations to Cosimo's bones reflect his life, such as from horseback riding, is fascinating. With Eleonora, the show compares early and late portraits of her to show how thin she had become later in life, at a time when written sources say she was coughing up blood. It sounds like tuberculosis. Apparently Fornaciari and company are going to try to find evidence of the TB-causing bacterium, but there's no mention of whether there are any bone changes that might suggest TB (like damage to the vertebral column). In addition to the skeletons from Cosimo and his immediate family, the team also takes a look at some of the last Medici interred here, only to find that the tomb had been plundered, likely soon after it was originally sealed. There are also excursions to Cosimo Medici's library and to a subterranean room which Michelangelo decorated when he was in hiding there during a war, as well as a bit about Galileo. While these add-ons seem to be a little padding, they are so interesting that I didn't mind them. There is a bit of murder mystery hype in Crypt of the Medici, but the genuine excitement at the opening of the crypts and the examination and analysis of the bones more than makes up for that. The program is well worth seeing if the study of human bones or the Medici and their achievements interest you. Mummy Detective: Crypt of the Medici premiered October 17, 9:00 pm, on The Learning Channel. It will air again on October 21 and 24, check your local listings. The Medici on Wall Street is at Federal Hall (corner of Wall and Nassau/Broad Streets); weekdays through November 12.